The electric guitar with music personalized Christmas ornament is a choice gift for a new player, accomplished pro or someone who simply loves the music made by these popular instruments. Each of these musical instrument ornaments personalized by our lettering artists arrives in our velvet gift bag with a display cord already attached. 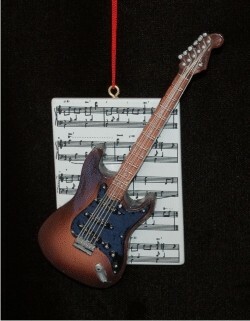 You or another recipient will love the authentic detail of the guitar electric with musical score personalized Christmas ornament that looks good on the tree or anywhere else it is displayed.